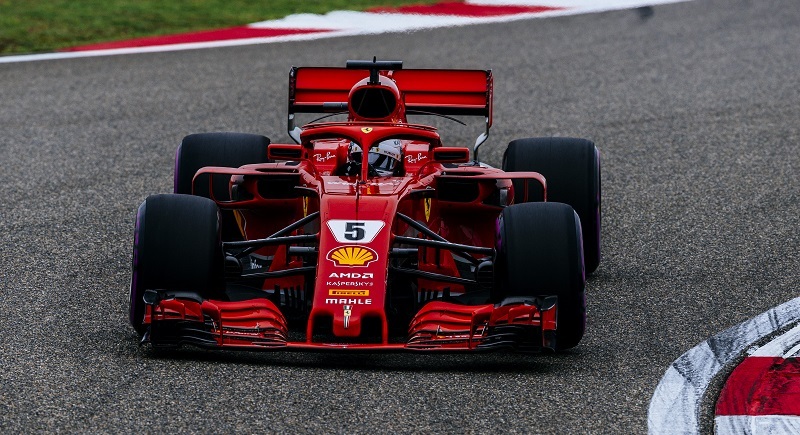 FORMULA ONE: Sebastian Vettel has sensationally snatched pole from Ferrari teammate Kimi Raikkonen in a thrilling end to qualifying for the Chinese Grand Prix today (Apr 14). Though Ferrari had established a sizable margin over Mercedes by the end of qualifying, Raikkonen had been the dominant driver, stealing a 0.16-second advantage over Vettel after the first runs. With Mercedes struggling to mount a challenge – Bottas and Hamilton were evenly matched but almost half a second down the order – the battle for P1 came down to the red-suited drivers. Raikkonen set purple sectors at the first two intermediates by a slim 0.05 seconds, but when the Finn finished his lap with a scrappy final sector, Vettel pounced, making up the difference across the line. The German beat his teammate by just 0.087 seconds to score his second pole positions in succession. “I was happy with the whole lap, not just the last sector,” he said. “The car was really amazing. It just kept getting better, so really happy. Raikkonen was surely feeling aggrieved to have surrendered pole after having an edge over Vettel for most of the weekend, but the Finn typically gave nothing away after the session. “It was okay, but not good enough,” he said. “It’s not exactly what I wanted, but we go to tomorrow and see what we can do. Valtteri Bottas was the better Mercedes driver in qualifying, but both he and teammate Lewis Hamilton struggled on the ultrasoft tyres in the chilly Shanghai conditions. There was little to separate the two silver-clad drivers after the first runs, but a mistake by Hamilton on his final lap was bad enough for the Briton to abandon the attempt entirely, allowing Bottas to confirm third on the grid by just 0.05 seconds. Red Bull Racing drivers Max Verstappen and Daniel Ricciardo never looked in contention for pole position but easily secured the third row of the grid, with the Dutchman beating the Australian by 0.15 seconds in fifth and sixth. Nico Hulkenberg was best of the rest for Renault in seventh but was 1.4 seconds off the headline time. The German, however, established a 0.3-second margin over teammate Carlos Sainz in ninth, with Force India’s Sergio Perez sandwiched between the two in eighth. Haas’s Romain Grosjean qualified 10th, just 0.036 seconds behind Sainz. The big question of the middle session was whether any team would attempt to qualify for the top 10 on the slower soft tyre, which would allow them to then start the race on that more durable compound. Only Ferrari and Mercedes felt sufficiently confident to give it a go, and though Vettel and Raikkonen both began laps on ultrasoft tyres as security in the final moments of the session, neither set a time, meaning them, Hamilton and Bottas will be able to execute a one-stop strategy tomorrow (Apr 15). Red Bull Racing’s drivers set only one lap each on the ultrasoft tyres, which left them vulnerable to improvements from the midfield drivers on the final runs. Renault’s Nico Hulkenberg and Haas’s Romain Grosjean jumped both, but neither of their teammates managed to emulate their performances, securing Verstappen and Ricciardo Q3 berths. Sergio Perez and Carlos Sainz snuck into Q3, eliminating Kevin Magnussen and Esteban Ocon in 11th and 12th. The upside for the eliminated Dane and Frenchman, however, is that both will be able to start on the advantageous soft tyre as opposed to the ultrasofts that their higher-placed teammates will be forced to use. Fernando Alonso led teammate Stoffel Vandoorne in 13th and 14th, with McLaren again qualifying slowest of all the Renault-powered cars, this week by around 0.3 seconds. Brendon Hartley qualified a further 0.3 seconds adrift in 15th. While 19 of the cars prepared to leave the garage at the beginning of Q1, Red Bull Racing mechanics were busy rebuilding Daniel Ricciardo’s car after he suffered a power unit failure a little over two hours earlier in free practice three. RBR principal Christian Horner said his team would need a miracle to get the car out in time to qualify, but with three minutes left on the clock Ricciardo left the pit lane to set one flying lap. It wasn’t a particularly quick effort, however – the Australian struggled to extract pace from the ultrasoft tyre, as was the case during Friday practice – and he set a time good enough for only P13. He fell to P14 after Renault’s Carlos Sainz completed his final lap, and he looked in danger of dropping out of the session, with Toro Rosso’s Brendon Hartley the only buffer between him and P16, but none of the Williams, Sauber or Toro Rosso drivers could usurp him. Hartley kept his place in Q2 for the second race in succession by 0.049 seconds over Williams’s Sergey Sirotkin in P16, while his Toro Rosso teammate, Pierre Gasly, set the 17th-fastest time. Lance Stroll in P18 led the Sauber drivers, with Charles Leclerc, who almost crashed his car when he ran wide out of the last corner before his final lap, heading Marcus Ericsson by half a second.